Tearing through laundry, messing up the bathroom—river otters aren't all that different from human toddlers, as one Missouri biologist and his wife learned when they raised orphaned pups. Watch as Glenn and Jeannie Chambers endure "otter chaos" to teach Paddles and Babyface how to swim, to eat fish Popsicles, and generally to be themselves—all leading up to an emotional farewell. A tiny bird so rare and unusual that its scientific name means "strange owl" has been spotted for the first time in the wild, scientists announced yesterday. Conservationists working in Peru got their first natural glimpse of the long-whiskered owlet last month while working in a private mountain reserve. The species wasn't even known to exist until 1976, and since then the only known living specimens have been those caught in nets at night. "Seeing the long-whiskered owlet is a huge thrill," said David Geale of Asociación Ecosistemas Andinos, who was part of the research team, in a press statement. The American Bird Conservancy, which partnered in the research, described the sighting as "a holy grail" of bird biology. As few as 250 of the owlets are thought to exist, scientists said, and the birds are as distinctive as they are rare. Controversy over the treatment of live animals in urban Asian markets rages on. Asian-American leaders have accused animal-welfare activists of racism, and the activists call the merchants callous animal torturers. A new bill in California aims to end the battle once and for all. A deadly species of jellyfish, translucent and the size of a thumbnail, is spreading along Australia’s coastline as a result of global warming, scientists warned today. Irukandji jellyfish are among the world’s most toxic creatures – all but impossible to detect in the water but packing a potentially lethal punch belying their tiny size. Until recently it was thought that they were confined to Australia’s northern tropical waters, but marine biologists have now found them off Queensland’s Fraser Island — a popular tourist spot about 400 miles south of their previously assumed range. Their discovery has halted production of a Hollywood film, Fool’s Gold, starring Kate Hudson and Matthew McConaughey, who were originally due to be filmed swimming in the sea. Dr Jamie Seymour, from James Cook University, said she had found five of the animals off the island. “You can’t now say the waters around Fraser Island are jellyfish safe. I mean, these animals have the potential to kill you,” he told ABC radio. “The ones we were catching weren’t any bigger than your thumbnail. They’ve got tentacles that are probably a half to three quarters of a metre long, and pretty much transparent. So unless you really know what you’re looking for, you’re not going to see them in the water.” If they migrate south in sufficient numbers, irukandji would threaten the safety of swimmers, surfers and snorkellers along southern Queensland’s Gold Coast and Sunshine Coast holiday destinations. Little is known about their biology but their toxicity is legendary. One of the tiny jellyfish was blamed for killing a 58-year-old British tourist, Richard Jordan, in the Whitsunday Islands of Queensland in 2002. A few months later, a 44-year-old American tourist was stung and also died. The newly opened Three Birds Market is the biggest collection and distribution centre for cats, dogs and all kinds of birds in Southern China, and officially operates as a poultry market. Cat and dogs crammed inside cages with no room to move, many of them diseased, all destined to be sold as food. These are the shocking pictures from a live animal market in Nanhai, China. Small metal baskets no more than 4ft long and 2ft wide house anything up to eight cats at a time. Trucks arrive containing cages packed with dogs that have not been fed or watered for days ahead of their slaughter. Disease is rife. They will soon be dead and sold as meat. Deep in the heart of the Kanchanaburi province in Western Thailand there lies a Buddhist temple with a difference. For not only is this temple home to monks who spend their time in prayer and meditation, over the last 7 years it has become a sanctuary for tigers. When villagers found an orphaned tiger cub, they went from place to place seeking help. Upon arrival at the monastery, the cub was welcomed out of compassion and saved from certain death. Since then many more orphaned tigers have found refuge under the abbots loving care. Sorry, no pictures! A woman was caught with three crocodiles strapped to her waist at the Gaza-Egypt border crossing after guards noticed that she looked "strangely fat," officials said. The woman's odd shape raised suspicions at the Rafah terminal in southern Gaza, and a body search by a female border guard turned up the animals, each about 50 centimeters (20 inches) long, concealed underneath her loose robe, according to Maria Telleria, spokeswoman for the European observers who run the crossing. "The woman looked strangely fat. Even though she was veiled and covered, even with so many clothes on there was something strange," Telleria said. In her defense, the woman said she "was asked" to carry the crocodiles, said Wael Dahab, a spokesman for the Palestinian guards at the crossing. The woman was not the first to try to illegally smuggle exotic wildlife through the Rafah crossing, Dahab said: another woman tried to bring in a monkey tied to her chest, and other travelers tried to smuggle in exotic birds and a tiger cub. Border guards more frequently confiscate cigarettes, prescription drugs and car parts. An environmental group said Tuesday it had captured a "monster" toad the size of a small dog. With a body the size of a football and weighing nearly 2 pounds, the toad is among the largest specimens ever captured in Australia, according to Frogwatch coordinator Graeme Sawyer. "It's huge, to put it mildly," he said. 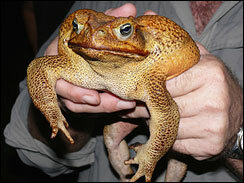 "The biggest toads are usually females but this one was a rampant male ... I would hate to meet his big sister." Frogwatch, which is dedicated to wiping out a toxic toad species that has killed countless Australian animals, picked up the 15-inch-long cane toad during a raid on a pond outside the northern city of Darwin late Monday. What Happens When You Tickle a Lab Rat? Aristotle declared that humans are the only animal to laugh, but then, he never saw this video of Jaak Panksepp tickling rats. When you play it, you’ll hear the tickled rats chirping — an ultrasonic noise that’s audible thanks to the special equipment that enabled Dr. Panksepp and his colleagues to discover this phenomenon. Young rats make the same chirp when they chase and play with one another, and they like to hang out with other rats who chirp at this frequency (50 kHz). It seems to be a happy sound: rats will run mazes and press levers in order to be tickled, and they’ll emit the same chirp when the dopamine reward circuits in the brain are stimulated. Some researchers still aren’t sure these sounds qualify as animal laughter, but Dr. Panksepp, a neuroscientist at Washington State University, has been systematically gathering evidence of the parallels to human laughter. In this game, you will find out if you can train a dog to drool on command! Ivan Pavlov's description on how animals (and humans) can be trained to respond in a certain way to a particular stimulus, has drawn a tremendous amount of interest ever since he first presented his findings. His work paved the way for a new and objective method of studying animal and human behavior. A gallery featuring some of the elaborate courtship rituals engaged in by animals. Freedom of speech is guaranteed by the Constitution, but what about the freedom to bark? The North Dakota Supreme Court has rejected a claim that an anti-barking ordinance is unconstitutional. Fred Kilkenny got a ticket for his barking dogs in Belfield, N.D., even though he was in Mississippi at the time helping Hurricane Katrina victims. His lawyer argued that Belfield's anti-barking law is too vague to be fairly enforced. But the judges on the state's high court saw no reason to muzzle local officials. The ruling noted that similar dog-barking ordinances have constitutional teeth. Kilkenny may take his case to the U.S. Supreme Court. Bill Exner, 68, has his dentures back, but his wife said the mouse that stole them is now taunting him. The resident of Waterville, Maine, said he's caught the mouse three times, but each time it escaped. Exner told the Morning Sentinel he trapped the field mouse and placed in a gallon-sized pickle jar three times. He said each time the mouse escaped. "The first time, I left the top off the pickle jar -- I figured there's no way this guy can get out," Exner told the paper. "But he escaped, so the next time I caught him, I put the cover on loosely so he could breathe, and he got out again." After the third time, Exner discovered his lower dentures were missing. In the subsequent search, he and his wife found a small opening in a wall. With the help of their daughter's fiance, they tore a larger hole and retrieved the dentures. "The dentures were inside the wall, lying right there. They were not damaged. The mouse didn't bite them or anything. It's like he was saying, 'I'm going to get even with you for putting me in that jar,'" Exner said. Jellycat truffles are so nifty: they can sit up and pose, or lay completely flat for a portable and oh-so-soft blanket and, of course, be cuddled in any number of ways. Cute and cleverly functional! We think this pooch is particularly irresistable. Highly-detailed, high-quality Fairy Princess Costumes are perfect for trick-or-treating, Halloween parties, or photos. All costumes feature Velcro® closures for easy-on/easy-off dressing, and are available in an array of sizes to suit any dog. Coordinating headwear features an elastic band for a comfortable fit. Wipe Clean with a damp cloth. See how Jeb, a Madagascar hissing cockroach made his way to the Toronto Zoo. Jenifer Santee always dreamed of owning a tiger. But knowing that wild creatures should not be kept as house pets, she did the next best thing: She joined a small group of cat breeders working to create a fully domesticated look-a-like of the largest member of the feline family. "It's a designer cat that was bred specifically to preserve the beauty of an exotic animal," said Santee, of the SanteePride Cattery in Manteno, Illinois. Dubbed toygers, for toy tigers, these playful, black-striped felines have been registered as a breed with the International Cat Association (TICA) since 1993. (see photos of toygers vs. tigers) Santee is among 25 breeders worldwide working on perfecting the pedigreed cat. So far, 360 toygers—each valued at upward of $3,000 (U.S.)—have been registered with TICA. And starting this May toygers will join more familiar breeds—including Abyssinians, Persians, and Russian blues—that can be judged as championship cats at TICA-sponsored cat shows. Public demand for the tiny tiger replica is "overwhelming," Santee said, and has likely been fueled by recent national media attention on the breed's progress. The first comprehensive assessment of the world’s 162 species of grouper, a culinary favorite and important commercial fish, found that 20 are threatened with extinction unless proper management or conservation measures are introduced. Eight species previously were listed by the World Conservation Union (IUCN) as under extinction threat, and the new assessment proposes adding 12 more. A panel of 20 experts from 10 nations determined the extinction threat facing groupers, which are the basis of the multimillion-dollar live reef food fish trade based in Hong Kong and comprise one of the most valuable groups of commercial fishes in chilled fish markets of the tropics and sub-tropics. Around the world, consumers pay up to $50 per kilogram for grouper. “This shows that over-fishing could decimate another major food and economic resource for humans, similar to the loss of the cod stocks off New England and Canada that has put thousands of people out of work,” said Roger McManus, a senior director of Conservation International’s Marine Program. Two 45-day-old white lion cubs play inside a zoo in China's Heilongjiang Province March 8, 2007. The cubs will be released back into the wild. They're called oysters, but these fried delicacies don't come from the sea. Hundreds of people stood on line for up to an hour for a chance to taste mountain oysters over the weekend. About 130 of the sheep testicles were served at the 16th annual Mountain Oyster Fry in the old mining town of Virginia City. They weren't just fried, either. The mountain oysters were barbecued, stuffed and even served in tacos. The U.S. Fish and Wildlife Service has declassified the American crocodile as an endangered species, saying the animal has rebounded from the edge of extinction. The species has rebounded in the United States from just 300 in 1976 to an estimated 2,000 today. The reptile remains protected under the federal Endangered Species Act even though it was downgraded to a "threatened" species, making it illegal to harass, poach or kill the reptiles. "It's just one step closer to recovery, but it still has many, many threats," Fish and Wildlife Service spokesman Tom MacKenzie said in announcing the move Tuesday. "It's still protected with the full force of federal law." Scientists estimate modern-day ants first evolved about 120 million years ago. But the fossil record suggests that ants at this time weren't the prevalent insect that they are today. Not until 60 million years later, when some ants adapted to the new world of flowering plants and diversified their diets, did the critters achieve ecological dominance. Since then they've had a successful run of the planet. Scientists estimate that about 20,000 ant species crawl the Earth. Taxonomists have classified more than 11,000 species, which account for at least one-third of all insect biomass. The combined heft of ants in the Brazilian Amazon is about four times greater than the combined mass of all of the mammals, birds, reptiles, and amphibians, according to one survey. Nuthatches appear to have learned to understand a foreign language _ chickadee. It's not unusual for one animal to react to the alarm call of another, but nuthatches seem to go beyond that _ interpreting the type of alarm and what sort of predator poses a threat. When a chickadee sees a predator, it issues warning call _ a soft "seet" for a flying hawk, owl or falcon, or a loud "chick-a-dee-dee-dee" for a perched predator. The "chick-a-dee" call can have 10 to 15 "dees" at the end and varies in sound to encode information on the type of predator. It also calls in other small birds to mob the predator, Christopher Templeton of the University of Washington said in a telephone interview. "In this case the nuthatch is able to discriminate the information in this call," said Templeton, a doctoral candidate. The findings by Templeton and Erick Green, an associate professor of biological sciences at the University of Montana, are reported in this week's online edition of Proceedings of the National Academy of Sciences. What's in a Can of Dog Food? A pet-food manufacturer recalled 60 million units over the weekend after at least nine cats and a dog died of kidney failure. No one has identified the source of the contamination, but the company said the recalled products included a suspect batch of wheat gluten. What else goes into pet food? Thanks to the U.S. Food and Drug Administration—which oversees the pet-food industry with the advice of the Association of American Feed Control Officials—the list of ingredients on a tin of dog chow gives you a general sense of what's inside. But pet-food companies manipulate the order of the list such that meat (and meat byproducts) appear first, even when other ingredients are used in larger quantities. An ancient arboreal lizard coasted through the air using a winglike membrane stretched across elongated ribs, a new fossil reveals. Dubbed Xianglong zhaoi, the gliding lizard lived during the Early Cretaceous period, about 150 million years ago. The specimen, detailed Monday in the Proceedings of the National Academy of Sciences, is about 6 inches (15.5 centimeters) long, and its immature features suggest it died at a young age. The fossil, described by Xing Xu of Shenyang Normal University in China and his colleagues, was discovered in northeastern China's Liaoning Province, a site that has yielded a treasure trove of feathered dinosaurs and early bird remains in recent years. There is still plenty of concern for pet owners following the dog and cat food recall by Menu Foods. The company says a number of cats and dogs have suffered kidney failure after eating its products. And about ten of them have died. So, how do you know if your pet is sick? Pitt County veterinarian Dennis Johnson says dogs or cats that have eaten the tainted food will show symptoms like tiredness, weakness, vomiting and diarrhea. For more information on product codes, descriptions and production dates, click here. A three member panel disqualified Ramy Brooks from the 2007 Iditarod Trail Sled Dog Race for abusing his dogs along the race trail. Witnesses in Golovin provided information to race officials detailing abusive actions by Brooks to his dog team. Brooks acknowledged "spanking" the dogs in his team with trail marking lathe. 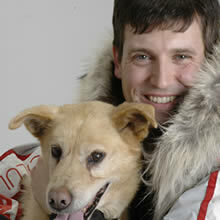 The judges voted unanimously to disqualify Brooks from the 2007 Iditarod. A sugar substitute found in a variety of sugar-free and dietetic cookies, mints and chewing gum is proving highly toxic, even fatal, to snack-snatching dogs. Xylitol, popular in Europe for decades but a relative newcomer to the U.S. alternative-sweeteners market, can be "very, very serious" to dogs when ingested, says Dana Farbman, spokeswoman for the Animal Poison Control Center of the American Society for the Prevention of Cruelty to Animals. "It doesn't take a whole lot (of xylitol), and the effects are so rapid that the window of opportunity to treat the dog is extremely small," Farbman says. The ASPCA sent an advisory to veterinarians last August warning them about the potential for serious harm or death. Veterinarians have used a variety of means to get the word out, including posting signs in their offices and making copies of the bulletin for clients to augment the caution the ASPCA has posted on its website. It's like something out of an animal horror movie -- killer frogs take over peaceful pond, then after terrorizing and eating everything alive, start eating each other. Only it's no movie. It's really happening in Golden Gate Park's Lily Pond, near the California Academy of Sciences. And after watching the frogs chew through everything in sight over the past several years, the city finally wants to do something about it. No one knows for sure when the African clawed frogs got into the pond or who put them there. But there they are, and the Toad Warriors have pretty much taken care of the native turtles, frogs and fish. "They've eaten everything they can get their mouths around, and now they're eating each other," said Eric Mills of the animal rights group Action for Animals. Mills worries that the fiendish amphibians -- which grow to 5 inches in length and have claws on the toes of their oversize hind feet -- may jump the pond and spread their reign of terror across other Bay Area waterways, although so far, none has popped up elsewhere. "The fear is they will get out,'' said Richard Schulke, president of the city's Animal Control and Welfare Commission. Your Poochy will be the Best in Show this Easter wearing this confection. Hand-knitted yellow sweater with green fluffy fringe. Pastel Easter Eggs are separately hand-crocheted, then beaded with small pearl beads. An amazing work of art, sure to please! Lightweight Gingham "Country Boy" flexible PuppyPurse Pet Carrier Swing your partner, do-si-dog! This lovely, lightweight gingham PuppyPurse puts the "country" back in the puppy. An added layer of ruffles will keep heads turning till the cows come home! So, git along, little doggies! Unlike other carriers, PuppyPurse has flexibility all figured out. With its easily adjustable swivel straps PuppyPurse is designed to let you find the most comfortable way to carry your pup. This unique carrier allows you to interact with your pet in his or her carrier the way other carriers can't. Not only that, it is particularly suited to small breed dogs who crave the attention and work so well with this flexible design. Jewelry cast from birds' feet. Chickens and partridges: belts and pendants.